Peter MacKeith has been named dean of the Fay Jones School of Architecture at the University of Arkansas, effective July 1. MacKeith is a professor of architecture at the Sam Fox School of Design & Visual Arts at Washington University in St. Louis. He has served on the Fay Jones School’s Professional Advisory Board for the Fay Jones School since 2011. The Fay Jones School includes the departments of architecture, landscape architecture and interior design. The school also has two outreach components: the University of Arkansas Community Design Center, whose work has received more than 90 design awards, and Garvan Woodland Gardens, the university’s botanical garden in Hot Springs. MacKeith began his tenure at Washington University in 1999 as a faculty member and assistant dean of the School of Architecture. In 2001, he became the associate dean of architecture, and was later named the associate dean of the Sam Fox School in 2006. He also serves as adjunct associate curator of architecture and design at the Mildred Lane Kemper Art Museum. Before joining the Sam Fox School faculty and administration, MacKeith was the director of the Master of Architecture – International Program at the Helsinki University of Technology (now Aalto University) in Finland. He previously held faculty appointments in architecture at the University of Virginia, the University of Ljubljana in Slovenia, and Yale University. MacKeith received a bachelor’s degree in English and international relations from the University of Virginia and a master of architecture from Yale University. His architectural teaching has been recognized nationally with two Creative Achievement Awards in architectural education from the Association of Collegiate Schools of Architecture (2007-2008, 2013-2014). MacKeith has worked in architecture and design practices in both the United States and Finland, notably with the renowned Finnish architect Juhani Pallasmaa. He has written, lectured and published extensively in the United States, Finland, and other Nordic countries on modern and contemporary Finnish and Nordic architecture. His particular emphasis is on the work of Alvar Aalto. In 2012, MacKeith was the curator and designer of “Light Houses: On the Nordic Common Ground,” the exhibition of contemporary Nordic architecture at the Nordic Pavilion at the 13th Venice Architecture Biennale. MacKeith is the author and editor of Archipelago, Essays on Architecture (2006), the editor of Encounters: Architectural Essays, volumes 1 and 2 – two selections of essays by Pallasmaa (2005, 2012) – and the author of The Dissolving Corporation: Contemporary Architecture and Corporate Identity in Finland (2005) and The Finland Pavilions: Finland at the Universal Expositions 1900-1992 (1993). He is the outgoing editor of The SOM Journal, a professional review of history and criticism, having overseen numbers 8 (“On Teamwork and Collaboration”) and 9 (“On Leadership and Authorship”). He is the recipient of a Fulbright Fellowship to Finland (1990) and research grants from The Graham Foundation for Advanced Studies in the Visual Arts and the Brookings Institution, among others. In February, MacKeith was recognized by the President of Finland for his contributions to the culture and architecture of Finland with the insignia of Knight, First Class, of the Order of the Lion of Finland. Two projects by the Fay Jones School, along with one by MacKeith, were recognized with 2013-2014 Architectural Education Awards given by the Association of Collegiate Schools of Architecture. The Pettaway Neighborhood Main Street Revitalization Plan, designed by the University of Arkansas Community Design Center, won an ACSA/AIA Housing Design Education Award, Excellence in Housing Education Course or Activity. 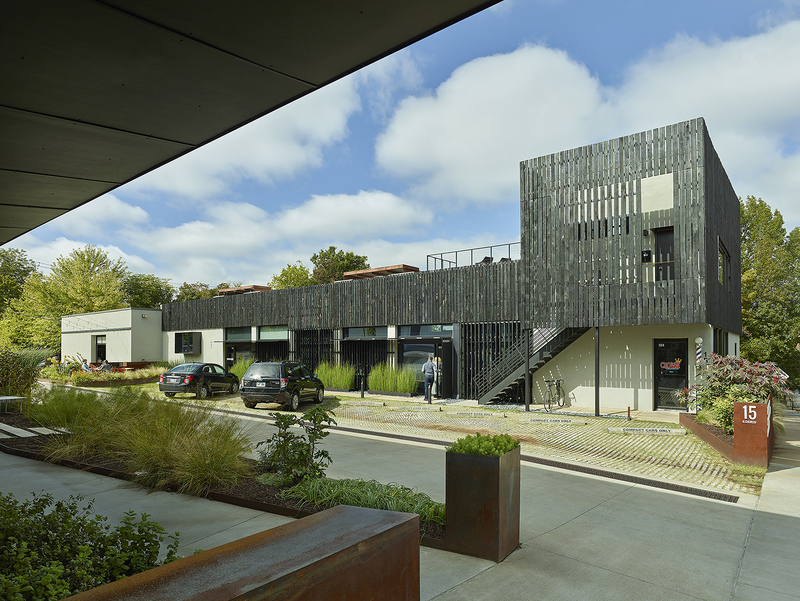 The Urban Prefab Initiative, a multi-year program of the Fay Jones School to design and build affordable urban housing in Little Rock, won an ACSA Collaborative Practice Award. Light Houses: On the Nordic Common Ground, a collaboration between MacKeith and Philip Tidwell at Aalto University in Finland, won an ACSA Creative Achievement Award.